A man who threw a plastic beer bottle on to the track at the start of the men's Olympic 100m final has been found guilty of public order offences. 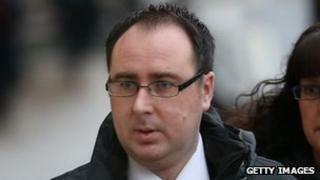 Ashley Gill-Webb, 34, of South Milford, North Yorkshire, was arrested at the Olympic Stadium on 5 August last year. Gill-Webb, who also shouted at athletes including Usain Bolt, was found guilty of two public order offences at Stratford Magistrates' Court. His lawyers had said he was suffering from a "manic episode" at the time. Gill-Webb was found guilty of intending to cause the 100m finalists harassment, alarm or distress by using threatening, abusive or disorderly behaviour, contrary to Section 4 of the Public Order Act as well as an alternative charge contrary to Section 5 of the act. Media captionEye witness John: "He threw this bottle and was dragged away"
District Judge William Ashworth said: "The two charges relate to a period of two to three minutes before the start of the Olympic 100m men's final on August 5 2012. "Mr Gill-Webb quite deliberately looked over his right shoulder and then round to look over his left shoulder to see if anyone was watching him and then stepped for concealment behind other spectators. "Satisfied that he was not under observation, he threw the bottle very close to the competitors who were listening for the starting gun." "The video, in my view, quite clearly shows Mr Gill-Webb checking to see if he is under observation before taking the risk of throwing the bottle. "I am sure that he was at that point weighing up the chances of being caught before throwing the bottle in an effort to disrupt the start of the race and put off Usain Bolt. "I am sure, therefore, that he was at that point acting rationally and wrongly." The court heard Gill-Webb, who has bipolar affective disorder, managed to get into the Olympic Park and the stadium using an old ticket. But no ticket was found on him when he was detained by police. He pushed his way through the crowd in the exclusive seating area close to the starting line from where he lobbed the bottle. He was confronted by Dutch judo champion Edith Bosch after he threw the bottle. She heard him say "Bolt, I want you to lose", the court heard. Other witnesses said he also shouted at other finalists, including Jamaican sprinter Yohan Blake and Justin Gatlin of the US. Bolt eventually went on to win the race in 9.63 seconds. Gill-Webb did not give evidence at the trial and had denied the offences. But his DNA was later found on the bottle. Following the verdict David Robinson, Deputy Chief Crown Prosecutor for CPS London, said: "Gill-Webb's decision to throw a bottle on to the track at the men's 100m final was reckless and irresponsible. "This incident came close to disrupting the most-watched event of the 2012 Olympic Games, which was broadcast to millions of people across the world and for which many athletes had trained for years".